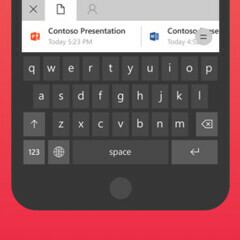 Back in February, Microsoft released a pretty interesting keyboard for Android: Hub Keyboard, which makes it easy for users to share documents (like Office 365 files) and contacts, as well as to insert copied text and various items - all without leaving the app, as the keyboard has dedicated buttons for each extra feature. Starting today, Hub Keyboard is also available on iOS, and you can download it from iTunes on your iPhone, iPod touch, or iPad. The app is free, and works on devices running iOS 9.1 or later. At the moment, Hub Keyboard for iOS only supports English, and seems to be available just in the US and UK (though Microsoft is working to add more languages and countries). If you try the app - via the source link below - let us know how you like it, okay? Interestingly, Hub Keyboard is Microsoft's second keyboard app for iOS, as the company recently bought Swiftkey (which has been available on both iOS and Android for some years now). Even more interestingly, it's been reported that the Redmond giant is also getting ready to bring the Word Flow keyboard (currently exclusive to Windows Phone and Microsoft Band) to iOS. Strange times we're living in, isn't it? Warning warning. No directly accessible digits. Avoid it.